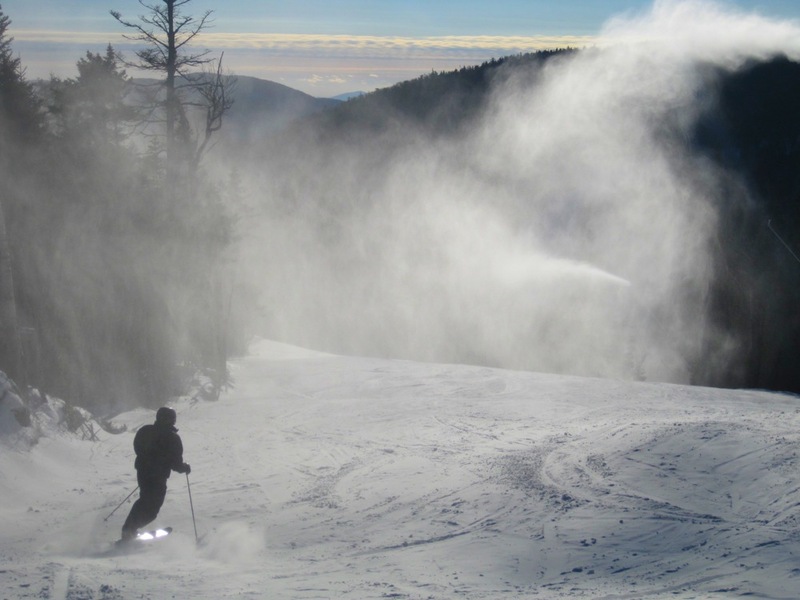 This past season was the unofficial “year of the snowmaker.” Snowmaking systems were pushed to the limit. At Gore, there was a somewhat fortuitous coincidence in this regard: a major snowmaking upgrade took place in the summer of 2011. The mountain added 160 high efficiency guns designed for precisely what the season dictated — constant resurfacing at marginal temperatures. As we mentioned earlier, we focusing this photo series on the spirit of the people who made this past season what it was. And while plenty of credit has been correctly given to snowmaking crews across the state, our focus here is on the skiers themselves. At many mountains in the northeast, there were several days this season when the only truly excellent conditions were right under the guns. One or two runs where you could lose yourself in the feeling of skiing on soft snow, even if it was purely manmade. The photo above was taken over Christmas break, on yet another day where mountain ops was resurfacing after some challenging weather. Guns had been focused on Gore’s lower mountain all day, and some bouncy bumps had formed Quicksilver. This picture was taken right at days end, higher on the mountain when a few of us noticed guns that had been fired up on Pine Knot. Our last smile-inducing run of the day and we were all alone.